$60.00/Day per llama, up to 29 rental days. $50.00/Day per llama, for more than 30 rental days. Two animals in a day = two rental days. Includes one pack llama, pack saddle, panniers, lead rope, night tether, picket stake and a scale. If you have not packed with llamas before, a two to three hour training course is required. All or part of your party may attend for $75.00. 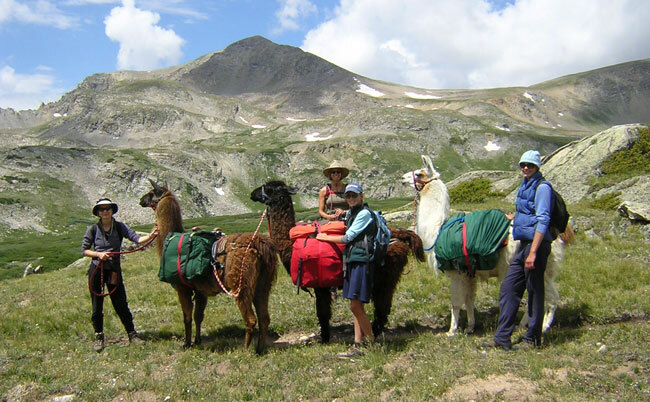 Antero Llama’s Llama Packing 101 workshop will teach you all the basic skills you need to handle llamas on your own in the back country. This course is scheduled several times per season, or upon request. Inquire for schedule and availability. Training is provided at the llama farm in Salida, or other locations may be arranged before a trip. Delivery to trail heads in the Salida and southern portion of the Leadville Ranger Districts. $2.00 per mile round trip to your trail head, for each trip. Trailers - $25/day (2” ball) if you prefer to transport the llamas yourself. If you have your own trailer, a van (with partition) or a pickup with a stock rack we suggest that you discuss the details of your equipment with us before your trip.